Early this year I took a class with Karla Alexander the creator of "Stack the Deck" method quilts, and emailed her a photo of the finished product. 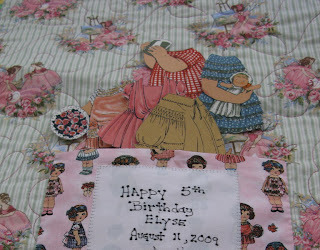 It was so much fun to do, and I love the quilt, and wanted her to know that. Who out of the blue calls this morning but Karla herself. She is taping a segment for "The Quilt Show" with Ricky Tims and Alex Anderson in September and would like to have my quilt for the show. What a thrill for me, I have to say. The offer came with an invite to the taping, but unfortunately I do work that day and it is one of those days I just can't miss. We bid for shifts for 6 months at a time, and I have to be at the bid! :-( I am so sad that I can't be there. I have been lucky enough to attend a taping a couple years back, and it was really fun. They load you up with lots of goodies too! Fun Fun. So I need to get a quilt label on it, and send it on it's way. I will keep you posted as to the air date and hopefully if your members you can watch for it. For those who are not, if you have high speed internet, it's the best thing out there. I get so much motivation from the show, and I can watch it any time day or night. Better yet for those nights of insomnia! But that won't be for tonight, I am seeing a good sound sleep and visions of quilt plum fairy's dancing in my head!!!!!! When I came across this wonderful piece of silkscreened Fireweed fabric in Alaska earlier this summer, I knew just what I had to do with it. I have a friend who is crazy over Fairies. It would be a perfect match. The fabric piece I bought was small, and I wanted a lap size quilt, so I played around with some scrap batiks that I had purchased. "Yes" scrap, when have scraps ever been the perfect answer to your problem, huh? It was a red letter day! 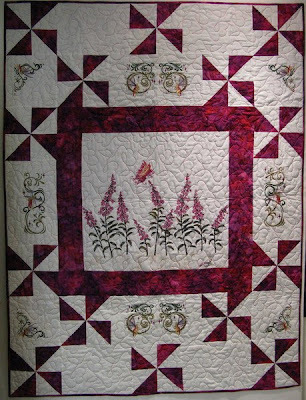 I searched thru Embroidery Library for Fairy designs, and this lap quilt was born. It was one of those, "I really have to give this one away" quilts. If only I had bought more of the Fireweed fabric. Darn! The quilt went to Kelly yesterday for her birthday and she was thrilled with it. As a quilter you can't ask for anything more. I think I enjoy, the joy it bring others, much as I love the making of the quilt its self. Guess that is really what life is all about. If only we could all adopt that kind of attitude, just think what kind of a world this would be. This week find "something" you love to do and share it with someone. You will be surprised at how wonderful it makes you feel. If we keep passing it along to others, maybe we can change the world a thread at a time! If your as old as I am, you well remember our beloved paper dolls. You can imagine just how excited I was, when they brought them back to us in fabric form. I had to get my hands on some of these great little gals. I wanted to give them a little bit of an updated look, so I cut out the little darlings, and appliqued them to some bright colored fabrics. With a little playing, I was happy with the end results of this project. A little tip that I picked up at my local quilt shop was to iron Deco-bond on the back of the clothing pieces. It give you just enough stability for the clothes to nicely stay on the dolls while playing. It worked like a dream. This was delivered to my favorite little Alaska girl who turned 5 this week. I sure hope that she enjoys them as much as I did when I was young. I have spent the past few weeks working away at getting some gifts finished up. Birthday quilts, baby quilts, and this great tote bag for a friend. I ran across the pattern for the Professional Tote on the Stashbusters website. One of the gals raved over the bag. A quick trip to my quilt shop turned up the pattern and the rest is history. This tote, if you haven't seen it, is probably the best bag I have ever had. If your like me, you have more bags than you'll use in a life time. This one beats them all hands down. I made my first one just before my trip to Alaska in June and was blown away at how great it was to travel with. There are so many pockets in it that I was able to carry on a complete overnight supply of clothes, and etc. I always travel with things to get me thru a day or two. It's my just in case factor, if the airlines loose a bag. With room for water bottles on the sides and so many zippered compartments it's just perfect. As for the sewing, the directions are very clear and other than lots of pieces, nothing was hard to do at all. All the seams are finished when your done and there is a great little strap that is on the back that slides over the handle of your luggage for ease of traveling. Could you really ask for more? The pattern is from the Creative Thimble. I recommend a trip to the website to see for yourself. As for this particular bag, it went in the mail to it's new home earlier this week. A thank you for fetching me at the airport and feeding me for a few days! I had a chance to visit an old friend for a long weekend and had a wonderful time. The wallet, coin purse and luggage tag were all made out of the scraps. She should be receiving her package today. Hope she likes it! Tommorrow I will be singing that ole song "Leaving on a Jet Plane" in my head again. I hope to be on my way to Alaska for one last trip this summer. I live to drive my youngest son crazy with my visits! What are mom's for anyway! I call it my turn. He bugged me for 20 years and the paybacks are wonderful for me! :-) The planes are full though and standby is just that. So we will wait and hope for the best. I have almost 2 weeks off from work now, so I have some time to play. Yeah!! Playtime my favorite! Now if I were only old enough to retire and have playtime forever, then we would be talking!!! Look forward to future whatever it holds!